Derry manager Damin McErlain talks to his players after their second win in two games aginats London in Ballinascreen on Sunday. 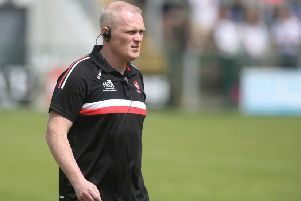 Pre-season Damian McErlain warned of the ‘dogfight’ facing Derry in Division Four and Sunday’s victory over London was the latest exhibit to illustrate exactly what he meant. The outcome was never in doubt but that doesn’t mean the Oak Leafers got things easy in Ballinascreen. London’s 1-02 in two first half minutes gave the Exiles a foothold their general play didn’t deserve but just like last week in Corrigan Park, Derry were handed nothing easy. The Exiles brought a physicality and defensive discipline that was horrible to play against and it asked questions of Derry, as did the tricky underfoot conditions. Losing both Shane McGuigan and Enda Lynn further tested the Oak Leaf mental resolve but it’s clear already, after only 140 odd minutes of Division Four football that psychology is going to play a major role in the bid for promotion. Facing the now familiar 1-13-1 formation, Derry had weathered the loss of McGuigan and Lynn and were doing what they needed to in what is a ‘can’t win’ division for the Oak Leafers this season. Win every game, secure promotion and ‘Sure it’s only Division Four’. Lose a game and the critics will be sharpening their knives. That’s the reality of Derry’s league predicament. Back to that 1-13-1 though. Inside half an hour, Derry had established a 0-8 to 0-3 lead that didn’t flatter them. Indeed had a couple of goal chances gone in the game would already have been over. If anything, Derry were too comfortable. Minds maybe wandered but in the blink of an eye a routine two points threatened to get away from them and better opposition may have extracted after heftier price. London’s scoring burst was as much about Derry concentration levels as any improved attacking prowess from the visitors but what it adequately illustrated was the dangers of underestimating this division. Modern football teams are well organised at every level and have the ability to punish teams who take their eye off the ball. The ‘It’s only Division Four’ mentality is a sure fire ticket to another season in the bottom tier and McErlain is adamant that Derry must set their own standards whatever the opposition. “That two minutes when we were slack in our passing and not as crisp into the breaking ball etc, that gave the game a different complexion at half-time,” admitted the Derry manager, “Thankfully we able to address the mental side of that at half-time and came out for the second half and probably worked a bit harder. “They were far more crisp in the tackle than we were in the first half and that’s an area we would be looking to improve on. The game itself was almost attack versus defence at times, London retreating into a defensive shell and seemingly content to defend a deficit. The odd roar of ‘Get it forward’ from under the stand at Dean McGlinchey Park was understandable but isn’t it strange that supporters always seem to place the onus on the attacking side to force the game even when they are well in front and they opposition are still camped inside their own half. The danger with prolonged spells of lateral passing is tempo. Too much drains a team’s tempo and injecting that pace back into attacking play at just the right moment is almost a fine art in the modern game. Concentration levels are almost always linked to tempo and intensity and that was the problem first half for Derry on Sunday. London lulled them in and took advantage in the first half on Sunday but ultimately didn’t have the ability to build on their one productive period but it is timely a warning that could serve Derry well in the next five games.